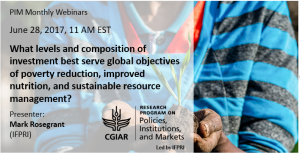 Our second webinar in the May-October 2017 monthly series, conducted by Mark Rosegrant, Director of the Environment and Production Technology Division at the International Food Policy Research Institute, was dedicated to findings from a recent analysis of the impacts of alternative agricultural investments on global objectives of sustainable development. Read the abstract and presenter's bio here. More information about the report discussed in the webinar here. See the full schedule of PIM webinars for May-November 2017 here.